There are few places in the world where lobster mariculture is successful. This is mainly because lobsters have several planktonic larval stages which may each require slightly different conditions and/or food. But, one of the biggest obstacles to raising lobsters is that they are cannibalistic as juveniles and thus must be separated into individual containers while growing. 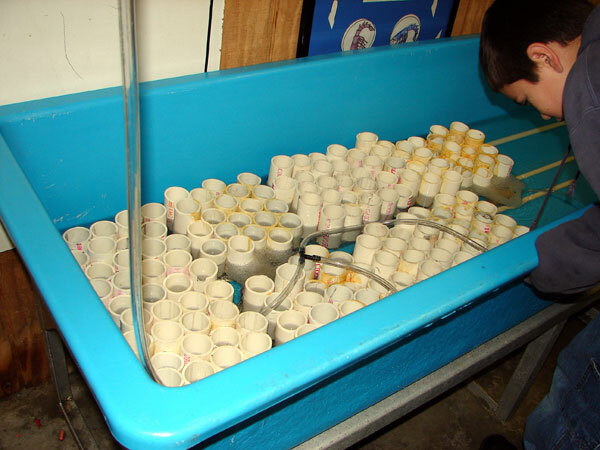 Because of this it is very time consuming (and thus costly) to raise lobsters in an artificial environment. East coast lobsters (Homarus americanus) are raised at the Oceanarium in Bar Harbor Maine successfully through the many juvenile stages. They release the babies at approximately an inch in length. Their purpose is to introduce thousands of baby lobsters into the natural environment to help maintain the population that is heavily fished in this area. Breeder female lobsters are supplied to the hatchery by local fishermen and kept in the breeder tank. These females keep their fertilized eggs under their abdomen while the eggs develop. In general, females have at least 10,000 developing eggs. Newly laid lobster eggs are dark in color when first attached to the underside of the female’s abdomen. As they develop they turn a lighter brown. When female lobsters are carrying eggs they are said to be 'gravid' - a term that is used for many female crustaceans who carry eggs under their abdomen. The developing fertilized egg reaches the early larval stage within the egg membrane while it is held by the female lobster under her abdomen. At this point the larva is ready to be released into the water and begin its planktonic phase. 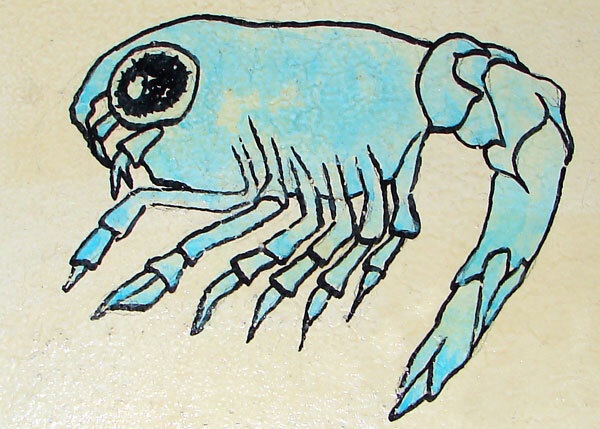 The early plankton stage of the lobster is microscopic. It will go through several stages while in the plankton until it is ready to settle to the bottom. 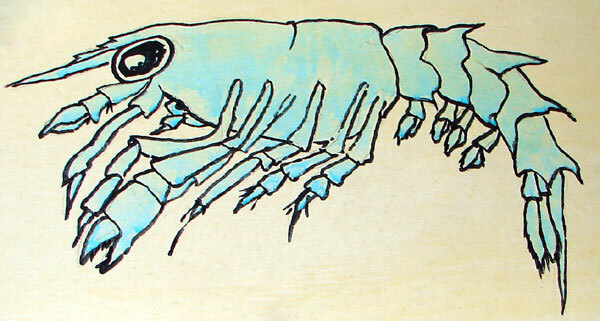 Between 1 and 7 mm, the early stage of the lobster larva is covered with a shell just like the adults. In order to grow this shell must be shed, after which the animal puffs up and secretes a new shell on the puffed up body. This process is called ‘molting’ and results in a ten to seventeen percent increase in size and a fifty percent increase in weight at each molt. The planktonic larvae are released into the water of the breeder tank in the hatchery. The hatchery workers use fine aquarium nets to capture these larvae and move them to special tanks for their planktonic development. The tall cylindrical development tanks provide the perfect environment for the planktonic stages. All four stages of planktonic development take place in the lobster hatchery inside the swirling water filled with food for the larvae. At about 9mm in length the second stage is reached. At this time changes in the swimmerettes, and tail become obvious. All planktonic stages cannot swim against a current and are thus carried wherever the ocean currents are running. They generally tend to swim up and then sink as they are carried along which keeps them near the surface of the ocean. The small fourth stage larvae prepare to settle as the planktonic phase of the juvenile lobsters comes to an end. In nature it is usually only 1/10 of 1 percent of the hatching eggs that survive to this stage. But, in a mariculture facility this can be increased dramatically. The high quality water and abundant food allows development to this last stage in two and a half weeks (instead of the normal six weeks in nature). The bubbling tanks provide a unique habitat for the larvae as the bubbles keep them busy adjusting to the disturbance. The juveniles will eat anything at this stage, including each other, but the bubbling cylindrical tanks reduce this cannibalism. This is a critical time for the juvenile lobsters. They are getting ready to take on a benthic (bottom dwelling) lifestyle, hiding amongst rocks and waiting for food to come to them. In nature usually only about half of the settling juvenile lobsters survive to the next year. The fourth stage juvenile lobsters are moved into individual compartments called ‘lobster condos.’ This is mainly because of their cannibalistic behavior. When they were in their planktonic stages the bubbling water and abundant food was enough to keep them from eating each other but once they get to the last stage they are good enough swimmers to swim against the whirling currents in the cylinders and start to eat each other. At this stage each juvenile looks like a small adult lobster and is moved to its own lobster condo. Moving the juveniles to the lobster condos requires a lot of time and at this stage it is no longer easy to keep them. 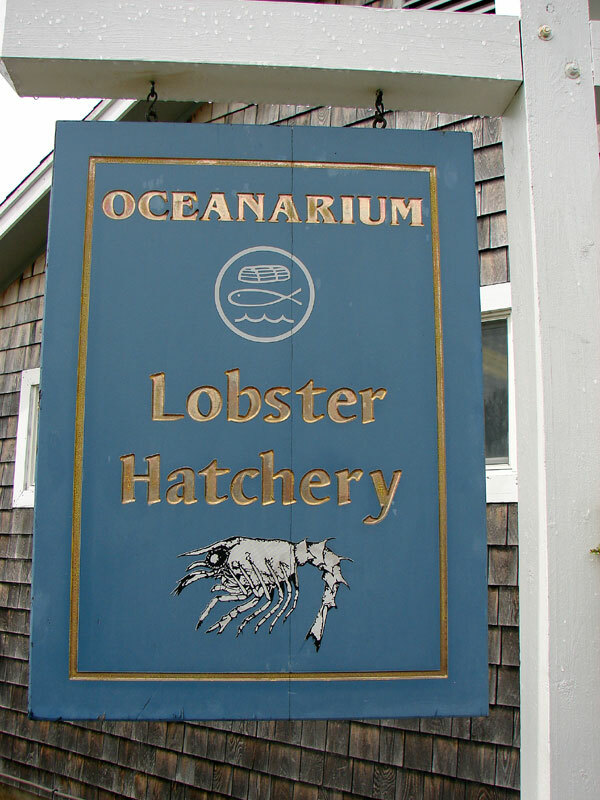 Since this hatchery does not grow the lobster to adult size this is the stage at which they are returned to the ocean. When the ocean conditions are good and there are enough juvenile bottom dwelling lobsters the hatchery arranges for a release date. 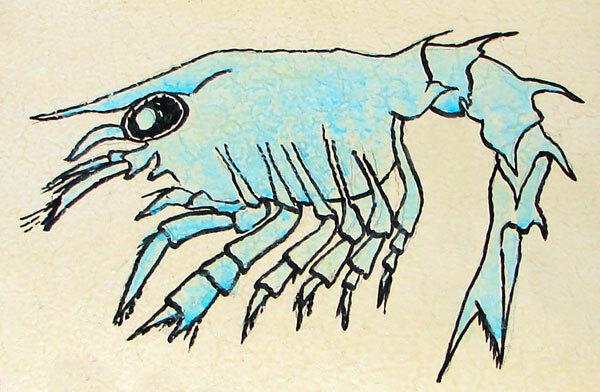 The juvenile lobsters are released in an area of small rocks, similar to the image above. They were originally released into the water by the hatchery and allowed to sink to the bottom but many of the babies just became fish food on their way down. The hatchery now pumps ocean water (containing the juveniles) through a tube that is weighted so it will deliver the babies to the bottom of the planting area. Areas with lots of little rocks (for appropriate hiding places) are chosen for planting by the hatchery. The baby lobster (at close to six inches in length) in the image is about a year old, much larger than the maricultured juveniles released. It lacks its protective pigment and would probably be eaten in the wild. 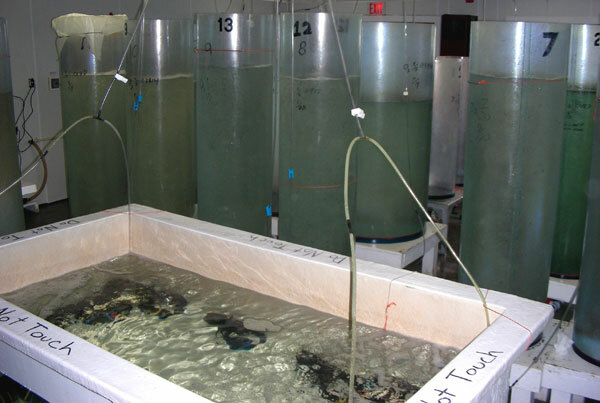 This picture is from a protected aquarium at the lobster hatchery for public display showing the typical type of ocean bottom that is best for the baby lobsters. This lobster hatchery is in the heart of the Maine lobster fishing area where there are over 5,000 lobster fishermen and several million traps out each year. 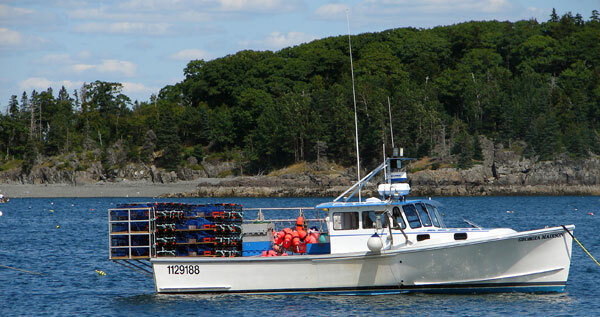 The lobster fishery is most active in summer when the lobsters move into the shallow coastal waters of Maine. If a female is caught with eggs she gets a notch cut into her tail and she is returned to the ocean. If this female is caught again by any other lobster fisherman she again will be returned whether or not she is carrying eggs. These known ‘breeding females’ are thus left in the ocean (until she may molt and replace her tail so that the notch is not seen. 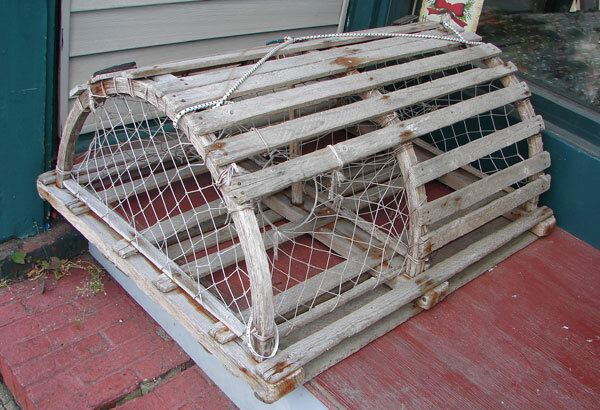 For many years lobster fishermen built their traps out of scrap wood. These traps were cheap and easy to repair however they tended to have a short life as the wood rotted. 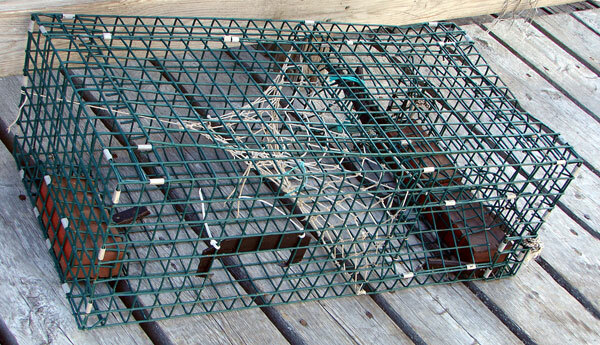 New lobster traps are made of wire and last a long time. They are more expensive however. A buoy marks each lobster trap and each fisherman has their own particular color on their buoy so they can easily be recognized. East coast buoys have a 'handle' that bobs in the water and makes the buoys easier to see when recovering them. 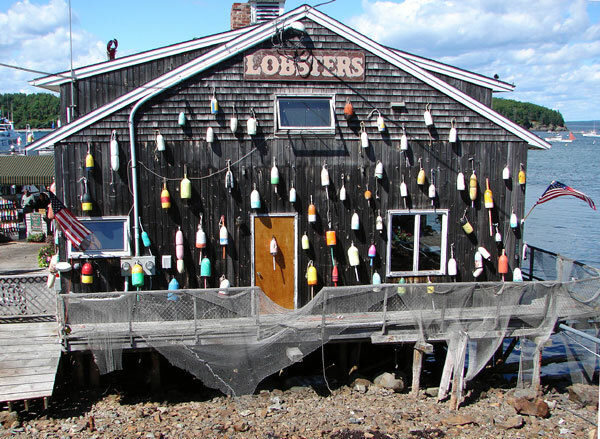 Lobster buoys are often used as decoration for the many seafood restaurants that line the New England coast. 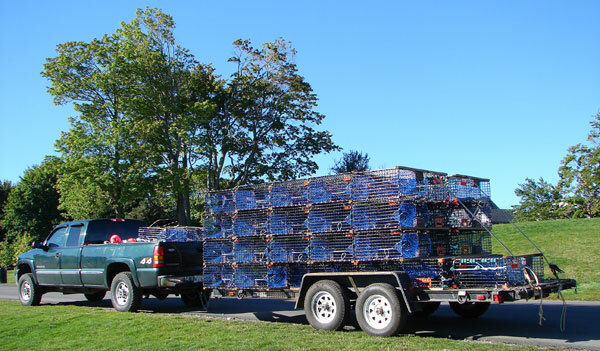 The Maine lobster fishery sends lobsters all over the world. 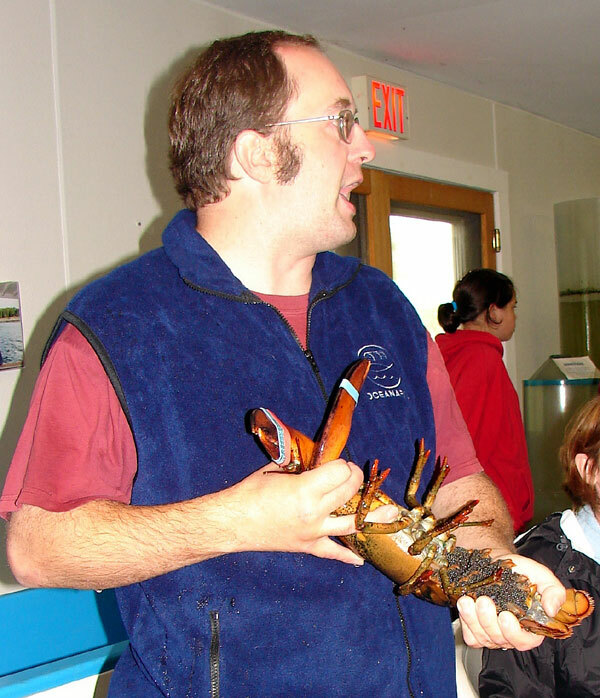 This species (Homarus americanus) is highly prized in restaurants for the sweet lobster meat in its large claws and tail. 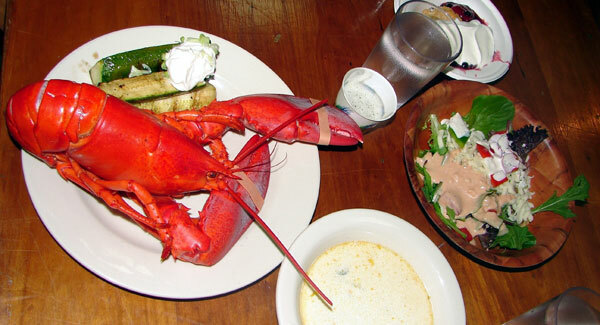 In California, on the west coast of the USA, lobsters are fished as well. 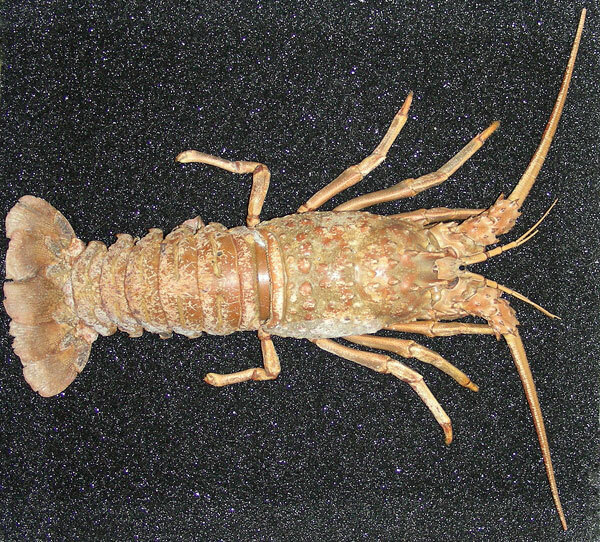 The California lobster is a different species (Panulirus interruptus), without the large claws, and with a slightly different taste. 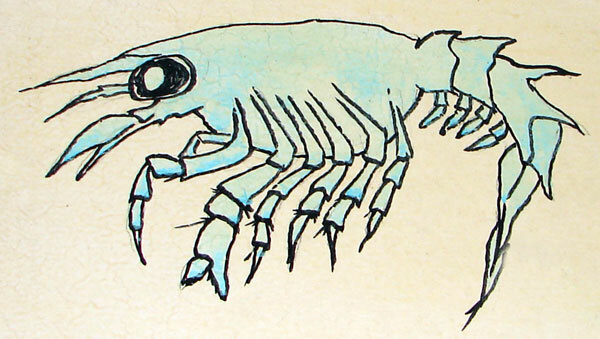 It is called the 'Spiny Lobster' because it has many sharp spines on its shell. The west coast lobster fishery is doing very well with lobstermen using the new style traps (wire ones) and buoys without the 'handle.' As far as I know (2007) there are no lobster hatcheries on the west coast to breed this species to enhance the natural population. Perhaps this is because there are fewer lobstermen and the catch has remained high, staying the same, for many years - indicating that the amount of fishing on the west coast may not exceed the 'maximum sustainable yield' for this fishery.